What a delightful surprise, Afternoon Tea in Shropshire at The Haughmond, Upton Magna a modern coaching inn. Keep Saturday afternoon free my sister asked, I have a surprise for you and my eldest sister. Clues had been dropped and we had worked out our treat was an afternoon tea, and 'oh my' how I love an Afternoon Tea. The fun began when my sister and niece chauffeured my eldest sister and I to our mystery destination. We headed down the B4380 from Wellington, I was thinking Lady Berwicks at Attingham Park, as I've enjoyed afternoon tea there many times, or maybe The Mytton & Mermaid. There was lots of deception and intrigue taking place, my sister indicated to turn into the Myttom & Mermaid but then turned into the entrance of Attingham Park, we proceeded to do a drive through the estate, to the exit - ha ha! But on we went, a few miles further to The Haughmond at Upton Magna. Conveniently located between Shrewsbury and Telford. This is the first time The Haughmond have held afternoon tea, and boy did they do a great job. I have heard many good things about the food at The Haughmond but have never eaten there. But my expectations were high. They have converted the private dining room to hold the afternoon teas, it was the perfect size and held around 7 tables and not too close to each other. The table was styled with classic white linen tablecloths, fresh flowers in quaint vintage styled glass jars. We were seated at the table by the window, I do like natural light makes it so much easier to admire the cakes. We were all anticipating some tasty and delightful scones and cakes, oh and of course sandwiches. But it's always the scones and cakes that get my attention. I blame that sweet tooth I was born with. Our order for tea was taken, they had a very good choice of teas. Breakfast, Earl Grey, Chamomile, to name a few and a good selection of fruit and herbal teas. With linen napkins placed on our laps we sipped our tea from the vintage china cups and saucers, and behold two wonderful 3 tired cake stands were placed on our table. There was a very good selection of sandwiches all served as traditional dainty finger sandwiches and very fresh. The sausage roll was tasty but rather jumbo compared to the sandwiches. I did spot that the table next to us had what looked like a very appealing mini vegetable quiche, I am quite partial to pastry, but who isn't. The were a number of highlights to this afternoon tea. The scones were quite simply perfection, slightly warm, light an absolute pleasure to eat. The jam was clearly not from a jar again very fruity and tasty and easy to spoon onto the cream. I'm a Devon gal when it comes to scones, cream first. I should add that the following week I had a cream tea at a local independent hotel whose fresh scones were heavy going and claggy to eat, with jam straight from tub. They could learn a great deal from The Haughmond. I have had many a lemon posset, and this one is up there with the best. In fact I could not fault the cakes, they were clearly freshly made and tasted light yet decadent. Just look at the sheen on the dainty chocolate cake. I am not a fan of Macaroons but my niece had no trouble in eating her share and mine. I was taken aback by the Bara Brith, I think I have only eaten this a few times and I was thinking tea loaf which is quite a heavy cake with no fat in it, So to bite into something so light and fruity was a real pleasure. The staff were attentive without being intrusive and happily topped up our teas frequently. We gave some feedback before leaving, as we were asked what we thought of the afternoon tea. We complimented them on serving a high quality afternoon tea with some great attention to detail, and quite frankly an absolute bargain at £15. Apart from missing a few extra pieces of cutlery and the giant sausage roll it was an outstanding success. One of the best afternoon teas I have experienced in a long while, and a delight to discover it so local to me in Shropshire. We did not quite manage to clear the 3 tiers of all the cakes and sandwiches, so I enjoyed the remaining cakes later that evening whilst watching Strictly Come Dancing, that's how my Saturday nights roll! 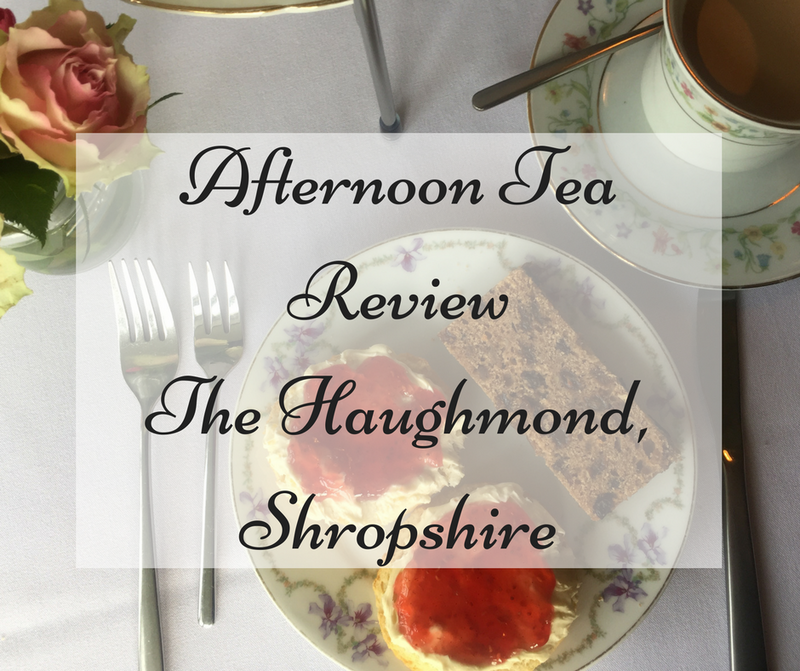 I am looking forward to enjoying another Afternoon Tea at The Haughmond. I wonder if they will do a festive version? Love Afternoon Tea? Read more of my reviews of Afternoon Tea at David Austin Roses, The Berkeley Hotel London, Fortnum & Mason, London. Do you have an recommendations for Afternoon Tea in Shropshire? Or maybe you have you discovered a tea room that serves the perfect scone. Follow me on Instagram, Facebook or Twitter. Oh my, that looks amazing. I love a good afternoon tea, it is such a treat of a meal. We went to a lovely one at Stoneleigh Abbey for my birthday earlier in the year and i swear they were the best scones I've ever tasted!